Moving to a new place is terrifying. Though some people might be worried about getting lost or the dangers of living in the urban jungle, my paralyzing fear is that I will have no friends. Meeting new people and putting myself “out there” puts my self-esteem on a slow boil. Before I can even get a word out, my insecurities begin to roll to the surface. Do I look alright? Am I too fat? Am I ugly? Do I smell funny? Do I talk funny? Am I too loud? Am I too weird? Why did you just do that, idiot!? You are so not cool! They will never like you! What were you thinking? Just shut up and walk away! Great, now everyone knows how stupid you really are! Before long, I’ve boiled myself into a silent corner of the room, thinking that no one will ever notice me, and hoping that someone will come save me from myself. See, I can pretend to be confident and strong, but there is a scared and very insecure girl inside of me that still holds on to all the negative things I’ve ever thought. Over the last couple of weeks I have made a larger effort to stay longer at the activities, attend the ones I wouldn’t normally want to go to, and actually talk to the people there. I am meeting more people and hope to develop friendships with current acquaintances. I even have a few friends that I am beginning to do things with on a regular basis. Opening up to new people brings the risk of rejection and ridicule. It also can bring new people into your life who will forever change who you become. It is those friendships that I look and hope for. I am reminded of that song from Disney’s The Hunchback of Notre Dame. There are those who see in the world only that which can hurt and harm. They shut down and brick themselves in; safe from the rest of the world, only to find that the pain has been bricked in with them. The devil takes on the roll of Frollo and would have us remove ourselves from every possible human experience. It is by breaking those boundaries and extending ourselves beyond what is comfortable that we are able to find friendship, love, and happiness. Our world and the people in it are imperfect. This means we will experience fear, doubt, anger, and persecution either within ourselves or directed at us by others. We can have hope and be reminded of “the gift it is to be [us].” Each of us has something that someone else wishes they had. Treasure each moment as yours because it is there for you to learn and bring you that much closer to who you can be. I don’t have to wish for just one day. I am blessed with a life full of them. I will face the rotten tomatoes, the jeers, and the Frollos in my life. I am stronger because of them. I am amazing, beautiful, and talented. I have worth because I am a child of God. Last night at FHE we did a talent show. I know the feeling you just had. A little shiver ran up your spine and fear tugged at your heart for a moment. Ward talent shows can be terrifying and AWFUL to sit through. There are always moments where you just wish you had one of those old vaudeville crooks to just yank someone off stage and save them from themselves. I’m happy to report that none of the performances were that awkward, and one of them rose above the rest to steal the whole show. Some BRILLIANT man decided that he should get a whole bunch of guys together and re-create the “Lonesome Polecat” song from the movie Seven Brides for Seven Brothers. They all wore plaid flannel shirts and work boots, grew out or drew on dark facial hair and had home made versions of the trees, axes and logs from the scene. From what I understand, some of the guys were a little wary of doing this show tune in front of 2 wards full of young single adults, at least half of which are girls. Now ladies, correct me if I’m wrong, has a man who can sing, dance, and look like a strapping backwoodsman EVER been anything other than a real man? I submit that there has not. Now, allow me a slight change of subject. On Tuesday evenings I attend a social dance class. It’s really just a group of people who enjoy dancing (and know enough to teach) that have invited their friends and anyone else who want to learn to come join in the fun. I have met so many fantastic people through this event, and I meet more every week. I am at an almost embarrassingly beginner level, but if there is one thing I have learned from this class it is that there is nothing in my experience that can compare to how feminine and pretty I feel when I am able to follow a good, strong lead. AND there is nothing more attractive on the dance floor than a strong and generous lead. There are so many things in our culture that “define” the “standard”. I put those words in quote because I believe that many of today’s cultural standards are just plain silly. Real Men don’t have to be aloof. Real Men don’t have to play games or chase skirts. Real Men don’t have to be made of steel or iron or be rough and tough. Real Men smile. Real Men are classy, modest, and confident. Real Men are a strong lead and a patient teacher on and off the dance floor. Real Men ask all the girls to dance. Real Men aren’t afraid to sing a show tune now and then. And Real Men know who they are and aren’t afraid to be just that. And, just in case you don’t get the picture just yet click on the one below. You know what they say about idle hands. Since I’m only working part-time and am not in school yet, I find that I have an abundance of time to myself. I usually get about 4-5 hours to myself each day. I realized today that I have not been managing that time so well. I’m not so good at keeping track of the things I need to do from home, and I can ALWAYS be working on my crochet projects because I now have a local store that wants to carry my stuff! So. I hereby declare that I will be productive during (most of) the time I spend at home! The devil can go play somewhere else. I have things to do. I have always been a fan of food. I like good food, I have begun to realize that what I like more than just good food is making and/or eating good food with good people. I don’t really like eating when it’s just me. When alone, eating becomes just another function necessary to maintain quality of life. Kind of like brushing your teeth or taking a shower. As a kid, mealtimes were always a production, and one that I hated being around for. Arguing over portions, fighting about who got to sit next to who, and other various things often made daily meals less than pleasant. 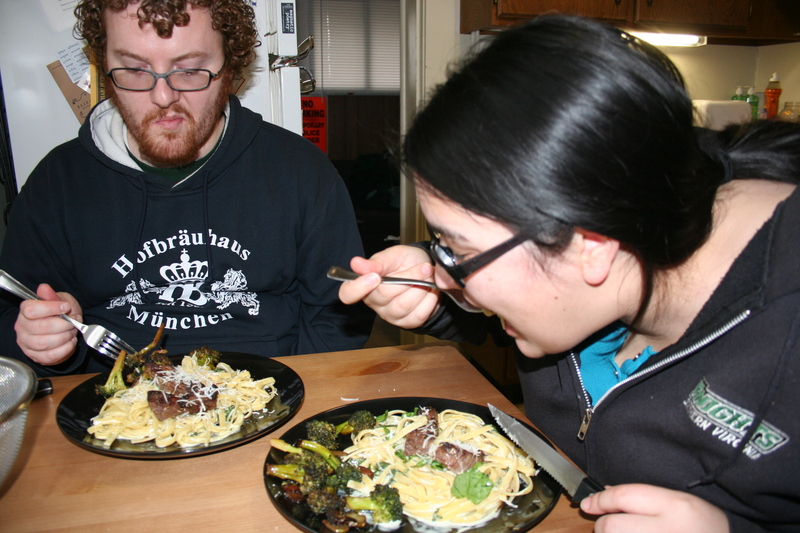 Now that I’m grown, I love making meals with friends and family. I love planning dinner parties and get-togethers. Even when I’ve been dirt poor, I’ve managed to throw together some pretty fantastic meals with some amazing friends. I like the “throw open the cupboards and see what we can put together and call a meal” game. Some of my best (and worst) recipes have been borne of those situations. On Friday I went to Olive Garden with my sister, her husband, and some other friends. My sister ordered their Steak Gorgonzola-Alfredo. Yesterday as we were planning meals for the week, she decided she wanted to re-create her meal from the evening before. Since it turned out so well, I thought I’d share the victory with all of you. I would also encourage everyone to plan a dinner party. Have friends and family over, make food together, eat together, and clean together. You’ll go home with good memories, a full and satisfied palate, and a happy pocket book to boot. AND… make family dinner a priority. The WHOLE meal. It is hard to hate someone that you have to wash dishes with. 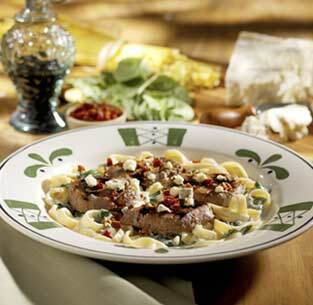 Grilled beef medallions drizzled with balsamic glaze, served over fettuccine tossed with spinach and gorgonzola-alfredo sauce. This is a bit of an involved meal, but the time spent is SO worth the finished product. Here’s what we did. 1 London Broil cut into smaller pieces. (Meat aficionados will have our heads for that, but it was on sale.) Marinate your steak for at least an hour in a mixture of Italian Dressing, Lemon Juice, and Rosemary (fresh if you have it.) I’d do about 1.5 cups of dressing and 1-2 tablespoons each of the lemon juice and rosemary. Cook the meat on a grill or in the oven to desired temperature. We baked ours in a 400 degree oven for about 20 minutes, turning the meat once. You’ll add a balsamic glaze over the finished product. We used a 1/4 cup of vinegar and 1 tsp of sugar and let it reduce over low heat. For your Alfredo sauce, start with 1 stick of real butter. Melt this in a sauce pan and add 1/2 a cup of cream or whole milk. Grate or add in about 8 0z of Parmesan cheese. Add more milk as needed to maintain a thinner consistency. Add in 3 oz of Gorgonzola crumbles. Keep stirring the mixture to keep a smooth texture. Once the cheese has melted, add about 4 cups finely chopped spinach. (We just grabbed a good sized bunch from the store) Unless you’re working in a good sized pot, you’ll have to add it a cup-full at a time. Once the spinach has reduced into the sauce, add salt and pepper to taste and then toss the noodles in the sauce. Place the pasta on a plate, and place some meat on top. 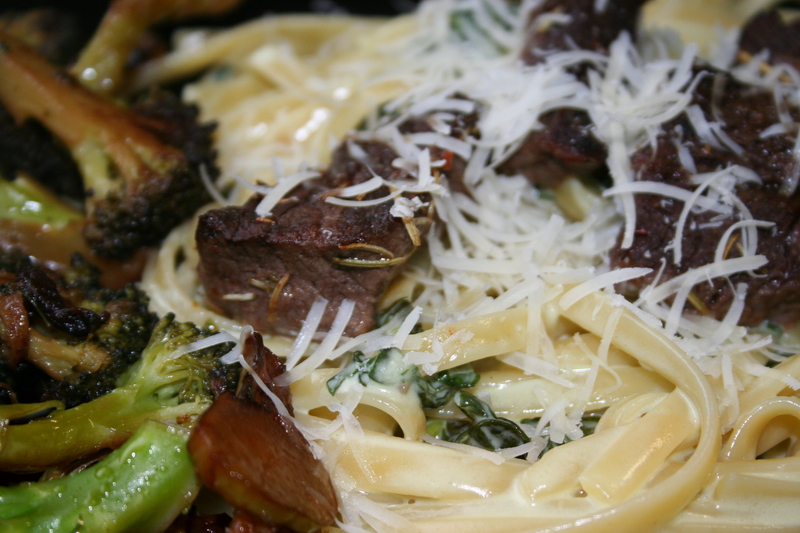 Drizzle the glaze over the meat and garnish with fresh grated Parmesan. The broccoli on the side is a specialty of Pete’s. 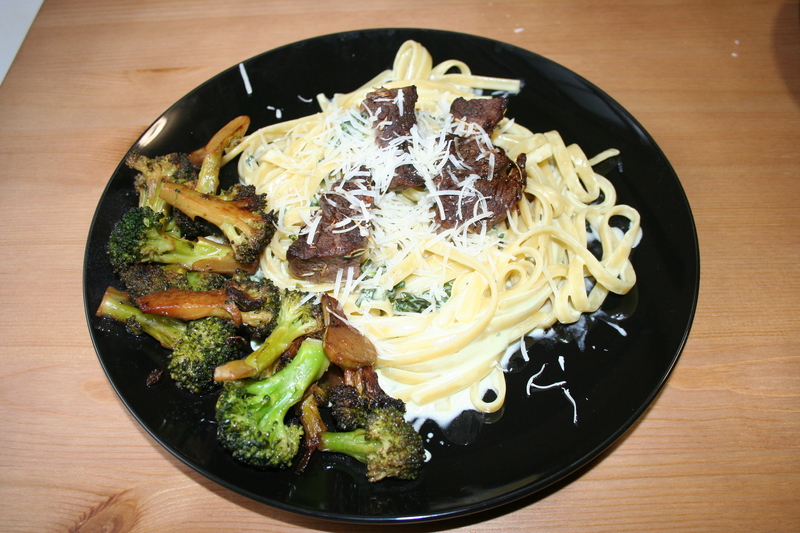 He sautes the broccoli in a bit of olive oil until just barely brown and then adds a little water and covers the pan for a couple of minutes, steaming the crowns until they’re not quite al-dente. Usually he just adds a bit of salt but tonight he tossed it with a bit of balsamic vinegar and it was soooo tasty! Family, isn't it about.... Time? Keep in mind that it has been MANY years since I’ve been anything close to a dedicated academic student. Life student, sure. I’m one of those every day, but in high school and college I was a bit lax in my studies (on a good day). So, in my role as older sister, example, and the one who isn’t Mom, I got on the phone and started asking her questions about the report and why she didn’t want to do it. It all made sense as I was explaining this to my little sister, but I realized that I never take that advice when it comes to my own projects. I am a professional procrastinator. If I think it will be difficult, lengthy, and uninteresting I will put it off until the absolute last minute. Nike was the winged Greek goddess of victory and daughter of Styx. She rose, along with her siblings Zelos, Kratos, and Bia, to the aid of Zeus during the Titan war. 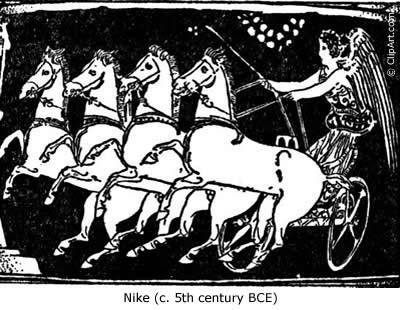 Nike became Zeus’ charioteer while her siblings stood sentinel next to the god. Once I have done my part, I don’t have to think about it any more. My Savior makes up for the rest. So, what is the value of $3.75? A bus fare and a household chore half done? Nope. As it turns out, $3.75 can buy hope, faith, and a whole lot of humility. For the last month or so I have been a temp for the Greater Salt Lake Area Chapter of the American Red Cross. I’m the assistant to the Executive Assistant to the CEO. Glamorous, I know. Really, I enjoy the work I do and it is fun to see how things are run from an internal-ish perspective. On March 11th the gears started really turning. I watched in horror as report after report showed the footage from the earthquake and subsequent tsunami in Japan. Calls began flooding into the Red Cross as everyone scrambled to figure out how to effectively handle the local response to this international disaster. As the days progressed I’ve been so amazed by the resiliency, humility, and respect that the Japanese people have displayed as an amazing example to the world. You don’t hear about looting or raiding. You hear about people lining up at grocery stores to purchase what meager goods they can obtain for their loved ones and neighbors. Since I am not part of any team that would handle donations I have just listened to what I can about the response that is happening in the Salt Lake Valley from others in the office who get to take the donations. People are calling to see if they can donate goods or clothing and how they need to go about contributing money. Corporations are responding with donations in the thousands, hundreds of thousands, and even in the millions. And the volunteer coordinator, Kristy, told a story about 2 small girls who came into the office with their parents because they wanted to give what they had, the younger of the two adding her five pennies from a zip lock bag. As a single girl who has spent lots of years living from paycheck to paycheck, and even sometimes living without a paycheck, I know that feeling. I understand what it is to look into your bank account and feel like you’re searching through couch cushions in an attempt to find what isn’t there. I have no idea what this woman’s life is like, but I know that her call reminded me that there is more that I can do. All too often I reserve those final pennies for myself, forgetting that my Father in Heaven can do so much more with them than I can. I am grateful that she was willing to donate what she had left. It is a reminder to me that there is always something that I can give. It doesn’t matter if it is my last five cents because with them the Lord can restore hope, build faith, and strengthen testimony. *For more information on how you can help and to find out what the Red Cross in your area is doing to help the relief effort in Japan please visit the American Red Cross website. Do what you can, you WILL make a difference.